Following a training session on Wednesday night where water wings and life rings were required to ensure all the boys made it off the pitch safely, the conditions on Sunday could not have been more different – thank goodness !! So far this season our p7 boys have shown some real promise both in attack and defence but have lost intensity at times which have cost us tries and games in tournament play. We arrived an hour before our first match on Sunday in order to get heads switched on and intensity levels up to match speed. That seemed to pay off in our first match against Musselburgh. Musselburgh are a tough side, and the forwards had to be on top form to prevent the ball being turned over and to create space for the backs to run. One such move resulted in a slither of space being created on the left wing allowing our backs to get the ball to the outside for a score. This turned out to be the difference between the two teams. After a long break, our second game was against a strong Biggar side, however, by this point our boys had been reminded of where they were playing and our anticipated result and took to the pitch with real determination. Some great aggressive forward play once again gave us plenty of ball to play with, allowing our flying wingers to stretch their legs and score at will. Some lovely link play led to a 5-0 victory and we were into the semi-finals. In our semi, we played against a well organised Watsons team who had played impressively in their pool matches. However, we showed great defensive line speed and aggression in the first time tackle and once more we turned over lots of ball, giving our backs the opportunity to show off their speed and skills. We won the match comfortably in the end, 3-0 and we were into the final. After a bruising encounter with Lenzie in their semi-final, Musselburgh made it to the other final spot and we faced them once again. Our boys only had one outcome on their minds and played very strongly, communicating well, supporting each other in attack and defence and moving the ball through hand to make best use of the space available. We won the final 3-0 and finished the day deservedly on top. 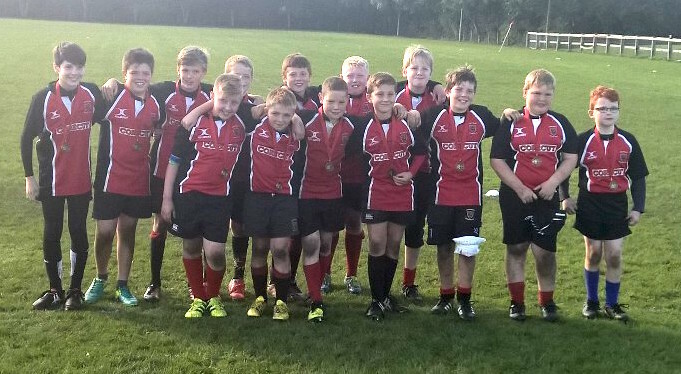 It was only after the final that we realised that our boys had played 4 tough matches without conceding a single try. It’s amazing what they can achieve when they all play with equal and consistent determination. Massive congratulations to all of the boys who played on Sunday. Every one of them played their part in the results we achieved and it’s hard to pick out individual performances, however, Conor’s ability to find and make best use of space on the wing to score a bundle of tries and Kinloch’s technique in the tackle and ruck stood out to the coaching team. Well done guys – bring on Kinross !! !